Residents rest in a shelter in is Baba Amr near Homs, February 8, 2012. 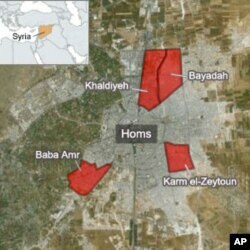 Syrian forces thrusting into the rebellious city of Homs, killing dozens of civilians. Syrian rights activists say government forces have killed at least 50 people in an ongoing assault on the central city of Homs, and U.N. Secretary-General Ban Ki-moon has pledged to consider sending a joint U.N.-Arab League team to Syria to monitor the escalating violence. British-based activist say troops loyal to Syrian President Bashar al-Assad attacked Homs with gunfire, rockets and shells on Wednesday, heavily damaging more than 20 buildings in rebel-held districts. The activists say the government bombardment of Homs has killed hundreds of people since it began early Saturday. They say at least 13 other people were killed in violence around Syria Wednesday. Syrian state media say "armed terrorists" detonated a car bomb in Homs, killing and wounding civilians and troops. State media also accused rebels of attacking the city's oil refinery. In an opposition video, a young man named Danny Abou Diyne, working in a field clinic in the Homs district of Baba Amr, points to the dead body of a two-year old boy. He says the child was killed when a shell slammed into his house, destroying it. “He's about two years old," he said. "He got hit in this war zone, in his house. Is this what the U.N. is waiting for, until there are no more children left? Until they kill all the children and all the women? VOA cannot independently confirm the video or opposition figures concerning deaths because Syria restricts independent reporting. A doctor calling himself Mohammed Mohammed told Al Arabiya TV via webcam that he and his colleagues were working under extreme duress and that medical supplies were running low. He begged the world to pressure Syria to allow ambulances to evacuate the wounded. Rami Abdel Rahman of the Syrian Observatory for Human Rights in London told Alhurra TV that the government shelling was creating a human disaster. He added that it is difficult to get an exact casualty figure because many people were buried under the rubble. Khattar Abou Diab, who teaches political science at the University of Paris, says Syrian military actions are taking place in a number of parts of the country and that most of the operations are under the command of President Assad's family members. He says the military campaign is taking place in the northern district of Idlib, the southern Horan region bordering Jordan, in the outer suburbs of Damascus, as well as in Homs. He says top members of Assad's family, including his brother-in-law Assef Shawqut and his brother Maher, are directing the campaign, resembling the Gadhafi family's involvement in the fighting in Libya. U.S. President Barack Obama said February 4 the citizens of Syria must know the United States is with them, and the Assad regime must come to an end. Russian Prime Minister Vladimir Putin condemned all violence "regardless of its source," but said February 8 outside forces should let Syrians settle their conflict "independently." Turkish Prime Minister Recep Tayyip Erdogan said Februray 7 the recent failure of the U.N. Security Council to pass a motion pressuring Syria was a fiasco. U.N. Secretary-General Ban Ki-moon said February 6 no government can attack its population "without its legitimacy being eroded." U.N. human rights chief Navi Pillay has called for urgent international action to protect civilians in Syria, saying she is "appalled" by the government's "willful assault on the city of Homs." French Foreign Minister Alain Juppe said February 8 Mr. Assad's reform promises are merely manipulation and should not be believed. Britain's Prime Minister David Cameron said Wednesday Russia and China had set themselves apart from Arab and world opinion by voting against a U.N. resolution on Syria. Turkish Foreign Minister Ahmet Davutoglu said Wednesday his government is ready to host an international conference to support the Syrian people. He said the conference should be held promptly in Istanbul or in another regional country. Davutoglu spoke before leaving for Washington to meet U.S. congressional leaders and Secretary of State Hillary Clinton for talks likely to focus on Syria. Washington has been exploring the possibility of providing humanitarian aid to Syrians in cooperation with U.S. allies. Western powers and Arab nations have said repeatedly they do not want to intervene militarily in the Syrian conflict. A senior EU official said the 27-nation bloc plans to announce a tightening of economic sanctions on the Assad government at a foreign ministers meeting February 27. The EU official said new measures against Syria are likely to include a block on financial transactions with the Syrian central bank and a ban on purchases of Syrian phosphates - one of the country's main natural resources. EU nations buy about 40 percent of Syria's phosphate exports. The EU stopped importing oil from Syria last year. The Kremlin said Russian President Dmitry Medvedev urged his French counterpart Nicolas Sarkozy to avoid "hasty unilateral moves" toward Syria. Mr. Medvedev spoke to the French president by telephone Wednesday. Moscow used its U.N. Security Council veto last week to block a Western and Arab-backed resolution that would have endorsed an Arab League plan calling on Mr. Assad to step aside. The Syrian president is a key Russian military ally. Mr. Sarkozy's office said he used the phone conversation to call on the Russian president to fully support the Arab League plan and increase pressure on Mr. Assad to stop brutally repressing the Syrian people. Russian Foreign Minister Sergei Lavrov met Mr. Assad in Damascus on Tuesday and secured a pledge from the Syrian president to assign his deputy to hold a dialogue with the Syrian opposition. But Syrian opposition groups have rejected dialogue with the Assad government. White House Press Secretary Jay Carney said Wednesday Mr. Assad had an opportunity to talk to the opposition early in the uprising, but Washington believes that opportunity no longer exists. Britain's Prime Minister David Cameron said Wednesday he has "very little confidence" in the Russian-Syrian efforts, while French Foreign Minister Alain Juppe said Mr. Assad's promises are merely manipulation and should not be believed. U.N. human rights chief Navi Pillay called for urgent international action to protect civilians in Syria, saying she is "appalled" by the government's "willful assault on the city of Homs." Pillay also said is it time for the international community to "cut through the politics and take action" to protect the civilian population. VOA Wire Services and reporter Dorian Jones in Istanbul contributed to the report.